Always popular with the people of Brighton & Hove, the Preston Park cycle track was home to many local cycling clubs post war and is still in existence today in 2007. The Sussex Racing League provided many of the events at this track, and thousands turned up to see the mid-week meetings at this venue. At the time, Brighton clubs had the advantage of training on the only hard track in Sussex, at Preston Park. The photograph shows various club members lining up for the start of a race at the track. Leading riders of the day were Eric Watts of the Brighton Excelsior Club, L D Glover of the Brighton Stanley Wanderers Club and Jimmy Knight of the Brighton Mitre Club. All three had won several Sussex Championships over the years. Wonderful memories; meetings were held every Wednesday evening through the summer. I had my very first snog at the back of the grandstand after one meeting! There were some very nasty accidents on the last bend with riders going over the top of the banking. I remember one of the better riders, Alan Limbrey. I wonder if he’s still with us? Re. the comment form David James above, yes, Alan Limbrey is still with us, he lives in retirement in Brighton. A friend of mine who visited me from the USA in September last year, also went and visited Alan and his good lady Wife. My next door neighbour for many years at 36 Newick Road, North Moulsecoomb, was a keen sports cycle rider. He unfortunately died some time ago but I’m sure some will remember him. He was best man at my wedding in 1952. George Webb, brother to Gordon who became the Station Master at Brighton Station. George worked at Allen West for a goodly number of years. Yes, I am still here and riding with the Sussex Nomads. Trouble is it takes 2 hours to do 25 miles now - but its still fun. Love to hear from you. 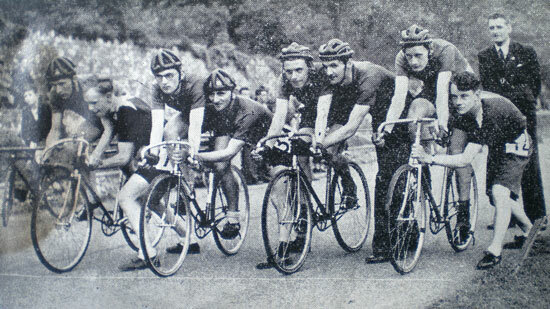 My father, John Cooke (still alive, but infirm, now aged 91), was a member of a couple of Brighton cycling clubs sometime within the 1930s – 1940s. I know, from what he has told me, that he took part in time trials but apart from a small cup which was awarded to him in the 30s, I have no other record of his involvement with the Brighton clubs. As he is becoming very frail and his memory starting to fail I was wondering if there are club archives which might go back that far and if there is any information relating to my father within it. I believe that he might have been a member of the Prestonville Nomads, The Mitre or the Excelsior. Any advice or help on this matter would be much appreciated. My brother sent this page to me. Our dad George J. Woodham A.K.A GJW. was always at the Wednesday meetings and the Bank Holiday Monday ones. First as a competitor for Brighton Stanley Wanderers, and then as one of the organizers. He compared the meetings quiet often. Our mum used to walk out to Preston Park with Dad’s spare bikes and us kids of which there were three so that dad could cycle there straight from work. I loved to see him ride. Sometimes we all sat in the stand, but sometimes we had a picnic tea. I have lots of lovely memories of a lovely window in time. Thankyou for bringing this back. I am so pleased to hear Alan Limbrey is still with us. I have mail from the Clarion from time to time and noticed that Ken (Wozzer) Wells is still about. I remember Eric and Ernie Johnstone, in fact I bought Eric’s Carlton track bike from him and raced regularly at Preston Park winning the club track championship I think in the early 50s. Joined Bournemouth Jubilee Wheelers after RAF and appeared at the Albert Hall in the early 60s in the British roller racing championships only to be pulled of my bike as we were held. The names Alan Limbrey and Wuzzer Wells took me back a long time. They were both fun and good times. Out for a Sunday club ride when someone called “sprint” and we all went charging up the road. I live in Florida, USA, now but spent many years in South America. I would love to locate any old friends from those times. Either email pedrocisne@aol.com or a phone call to 00-1-239-304-0277.